The REALITY Israel Experience is a unique leadership development opportunity for selected Teach For America corps members to spend 10 days exploring Israel’s education and social justice systems, gaining exposure to top Israeli leaders and thinkers, and uncovering and recommitting to the values that drive their passion for public service. It is a program of the Charles and Lynn Schusterman Family Foundation and the Samberg Family Foundation, in partnership with Teach For America and the ROI Community of young Jewish innovators.
. I also messed around a lot in Hebrew school and as a result only remember three things: 3 words of Hebrew, lessons about the Holocaust, and a lesson about Masada. Masada, in particular, truly gripped me. It was a mystery why people would voluntarily kill themselves–and yet, in such tragedy we find honor and beauty. I could never wrap my mind around it, and when I saw the itinerary for Teach for America’s REALITY program, I became excited when I saw we would be seeing Masada. I was enthusiastic about the opportunity to look for answers and to gain a deeper understanding as to why this tragedy happened and what we could learn about it. happened almost 2000 years ago. And what separates my caring from anybody else’s–why should it matter to myself or anyone else that I care? It’s not as though Masada is a rallying cry for a movement. In the past 17 years, the U.S. has been hit by bombings in Oklahoma City, the 9/11 terrorist attacks, Hurricane Katrina, and several more devastating tornadoes. We see in these events the fragility of life and the beauty of the lives we lead. We need to understand and see the pain of others to fully appreciate our own lives. I do not write this as a pessimist seeing a failing in man, but rather simply see that in tragedy there is beauty and we as humans are complex enough to see the beauty and the darkness simultaneously and intertwined. 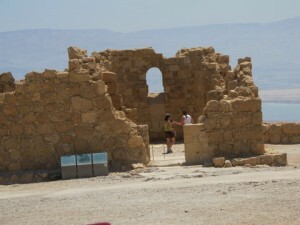 At the top of Masada such a hypothesis was confirmed. Even when others speak everything is silent. This place is about more than being peaceful and with one’s own thoughts: it is indeed confusing. All one can feel is an eerie aura that in the middle of this abyss, there was a bustling life. A major event happened, but you cannot see how. I stood in the middle and looked to the west and saw endless mountains and sand. In the east I saw the glistening Dead Sea (an appropriate name for my morbid yet hopeful thoughts). Within tragedy there is beauty and within beauty there is often tragedy. focus to a new one of young exciting professionals and the center of educational reform. Leaders are the people who see the homeless and work to put a roof over everyone’s heads, not just to give a band-aid of a few dollars. On the surface of any tragedy, natural or man-made, physical or social, no one cares that I care; however, it is my job to lead and deep down make people care and fix it. 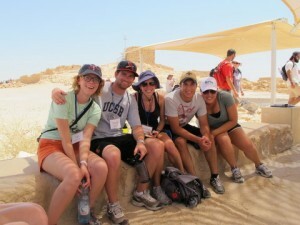 It is too late for me to help at Masada. I am 2000 years too late. However, I can help our youth. I can help inspire and do so in my own way. We are all on a mission to change lives–and change the educational system, which is a tragedy. I don’t just care about the tragedy, I take action on it. And these are steps we can all take. We must not take the easy route to solving whatever it is we perceive to be tragedy, but rather we must take the active and leading route. It is with this mindset that I realized an important point: I may not be a great Jew…but I can be a great leader. Jeremy Siegfriend teaches lower elementary Special Education in New Orleans. He has worked for a community court, Major League Baseball, NBC Olympics, and as a criminal investigator in Queens. Don't believe in God? In reward and punishment? The obligations of Jewish law? Here's why you should fast anyway.